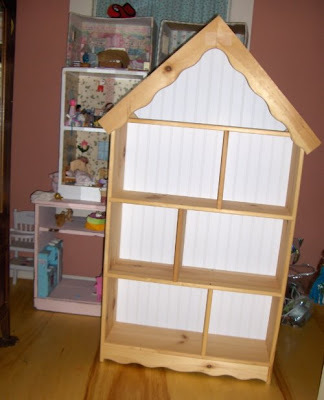 Yesterday my husband picked up a 20-dollar piece of white beadboard that he could cut to size and staple (with a pneumatic stapler) to the back of the bookshelf doll house I got from A.C. Moore. This makes the rooms look more finished. 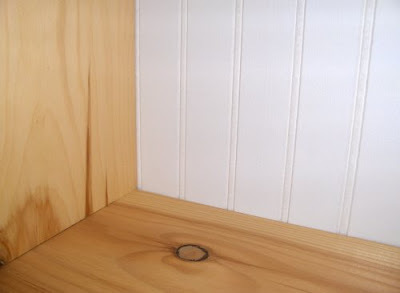 I would love to add lighting at some point, and perhaps stain the wood. Not sure yet. For now I am just going to clean off the scuffs and lightly sand a couple of places where the wood's not so smooth. Won't the dolls just love this? Not to mention my daughter! I can't wait to set up the little loft area!